I can’t even with this dish. It’s not my typical Monday dish but it is soooo now a Monday dish. I am begging for one more day of weekend so I’m just going to pretend today is it while I’m waist deep in boxes and throwing tantrums because I can’t find my 1. favorite whisk, 2. felicity DVD set, 3. neon pink nail polish and 4. all of the above. At least I can pretend it’s still the weekend food wise. Apparently right now I want all the seafood in the world. Salmon salads, mussels and lobster corn chowder are the things I’m seeing in my dreams right now. And just look at those butter bubbles! I practically want a straw. With how obviously freaking weird my tastebuds are at the moment, this was a welcomed change. It sounded like the best thing ever in the universe and well… it kinda was. Shrimp and grits isn’t a meal I gravitate towards often but something in the air was just begging for it. It’s one of Eddie’s favoritest of the favoritest things. The only thing he requested in the grits was… more butter. For real. So. 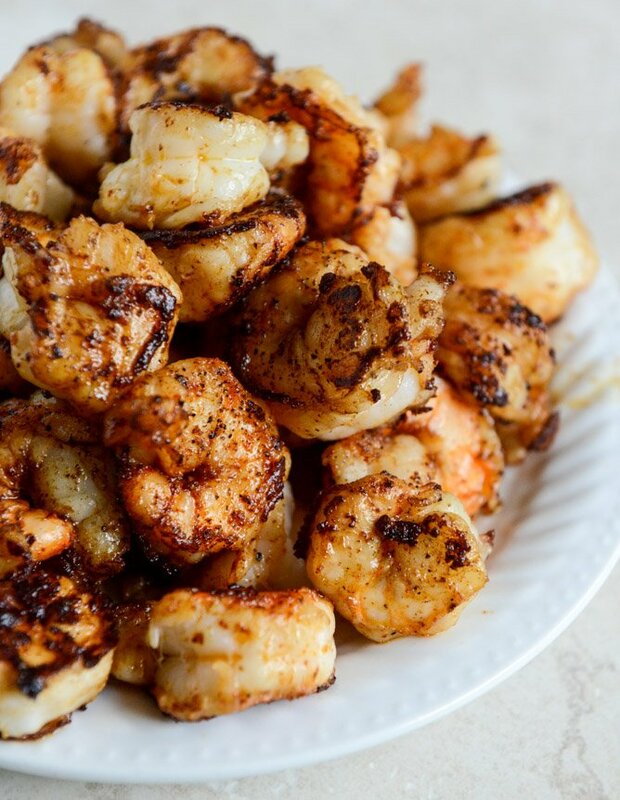 This shrimp is so simple but SO good. The spices have so much flavor, lots of butter browns as it cooks and you stir some flecks of garlic in at the end to top it all off. I can fathom eating it with everything – it is that good. I probably it. It’s def our new favorite way to eat these curly little shrimp. I cheated and used some quick cooking grits… I KNOW. You southerners are probably staring me down with disgust right now. I’m a hypocrite, I won’t use instant oats but I’ll use semi-instant grits. But when you add enough cheese to something, it always works. Right right? These grits take mere minutes and then you whisk in piles and piles and grated gouda. The GOOD gouda. 1 cup quick-cooking grits, I like the quaker 5 minute grits, but you can definitely use the stone ground if you’re a grit purist! – just follow the directions they come with. Bring the stock to a boil in a medium saucepan. Once boiling, add the grits and whisk constantly until they are fully mixed into the stock, about a minute or two. Reduce the heat to low and cover, stirring once or twice more, until the grits are thicker and creamy, about 5 minutes. Stir in the grated cheese, salt and pepper. Taste and season more if desired – this will depend on the salt in your stock and cheese. Pat the shrimp completely dry with paper towels. Once it’s dry, season it with the salt, pepper, paprika, chili powder and cumin. Heat a large skillet over medium-high heat and add the butter. Once it’s melted and begins to sizzle, add the shrimp in batches (don’t overcrowd it!) and cook on both sides until pink. The butter will brown as the shrimp cooks and you can whisk it occasionally to prevent it from burning. When the shrimp is finished, stir in the garlic (I stir a little in each batche of the shrimp) and cook for a second then place the shrimp on a plate. Repeat. To serve the grits, spoon them into a bowl and add the shrimp on top. I like to drizzle any of the butter in the pan on top too. Cover with spoonfuls of grilled corn (you can toss it in butter, salt and pepper!) and a sprinkling of chives. Eat immediately. I got into shrimp and grits after working with for a banquet facility during my Culinary training–it was so good! I’ve been in the south for almost 10 years now and never cared for grits until then. okay so CALL ME CRAZY but… i kinda want to try quinoa as a sub for grits. any ideas on how to get that same creamy texture? I had to come back and tell you I made this for a group of friends on Friday night. Thanks to you they all think I’m a rock star now! This was without hesitation one of the best meals I have ever made. Thank you for sharing this recipe. . So this recipe just made my day. My son was born in Alabama where grits are an institution. He had smoked Gouda grits not long ago traveling with his job and I promised I’d find him a recipe to try. Of course you came through!! Just preordered your book, can’t wait!! Oh my gosh – just made this – and it was AMAZING!! So easy to make and absolutely delicious! I swear this came out better than anything I’ve had at a restaurant! Awesome, awesome, awesome! This turned out great! The cheese shop was out of gouda so we used gruyere. Very good. Thanks for sharing. Yummy! I do something similar but with Gruyere. Very flavorful, and surprisingly easy to make. I will add this to my “Things to Make When I Want to Impress People” list. We made this last night and instead of Gouda, we used Brie (delicious substitute) and because we had some on hand, we threw in bacon for fun. It was AMAZING. We will definitely be making this again! This is by far the best tasting recipe I have ever made and I cook often and from many ethnicities. I added finely diced chipotle peppers to the grits (to match the chili powder on the shrimp). I also went with another recipe suggestion of using ½ water & ½ evaporated milk to make the grits to increase the creaminess. And lastly, I LOVE cooking corn in the husk in the MV for three minutes, then squeezing the ear out with NO silks. The corn cut off the ear is probably the thing that totally takes your recipe over the top. Or off the hook or whatever ‘they’ say these days. I love the added crunch. I have made this recipe for SO many of my friends and my husband brags all the time about how awesome YOUR recipe is. So I have forwarded your page to many people. AWESOME recipe. Thanks for sharing. I don’t know if you see comments on old posts but I wanted to tell you that we made this again last night (for probably the 5th or 6th time) and it is currently one of our favorite dishes. My bf loves to cook and he is crazy about how quickly this comes together and how flavorful it is. We have a friend who comes over for dinner once a week because he loves what we make, and last night he saw the box of grits and was like “Grits?? I don’t know if i am down with grits.” One bite in and he was like “Okay these grits are amazing.” Thank you for another awesome practical weeknight recipe. Love your blog! Can you tell me what WP Recipe Plugin you use? Hi Mary! It’s not a plugin – it’s a custom HTML box that my designer built into my site! As a southerner myself, I would never touch instant grits but I have no objection to the 5 minute kind. One thing I will mention here, if you cook your grits in chicken broth or a combination of water and broth, and eliminate the salt, you will get a much better, richer flavor to your grits. My apologies, as I read through the recipe the second time, I realized you did write using 4 cups of chicken broth! would you know what kind of wine would pair well with this dish? You might want something on the lighter side since the meal itself is dense and has so much flavor. Try a sauvignon blanc, or a pinot grigio if you like it. I made this tonight for my family and my 86 year old grandpa who is from the south and thinks grits is its own food group. So delish! Even my grandpa approved! Made this for my family tonight. I doubled the recipe for the grits and it was a huge success. Everyone loved it and I will be making it again. It was very easy to make and the flavors were wonderful. Thank you for sharing. Holy delicious! My only complain about this recipe is that it was so good that my husband I went back for seconds and ate the entire thing in one sitting. Awesome comfort food with great flavors! Will definitely make it again! This is an unbelievably easy and filling meal. I didn’t have to use nearly as much butter as the recipe calls for, so it is also low-calorie. It was able to yield at least 6 servings of grits for my family. We will definitely be making this again. Next time, I think I will halve the grits and keep the shrimp at a pound. Maybe add a squirt of lemon at the end if I have it around to brighten it up. I have been craving a good shrimp and grit recipe so I tried this recipe tonight for dinner. Wow, what a delight ! I have now added this to my recipe book to make again. A big thank you for sharing, it is a wonderful recipe ! Have made this numerous times and it’s one of our absolute faves! We consider it a “company” dish (one that impresses guests – Ha!) My husband doesn’t like garlic or chives so we leave that out and it is still outstanding!! So so good. Making it again now and needed to double check the recipe so I thought I’d add my comments and compliments. Thank you! Amazing flavor! everything turned out great! Thank you for a great recipe to add to my menu!